Last Friday after work, my ex-colleagues (who eventually became my friends) and I took a bus to Dempsey Hill to have our much awaited reunion. Dempsey Hill is a very popular gastronomic destination just a stone throw away from my workplace (two bus stops away to be exact). Superman have brought us to Dempsey Hill countless times before when we were all still working together. 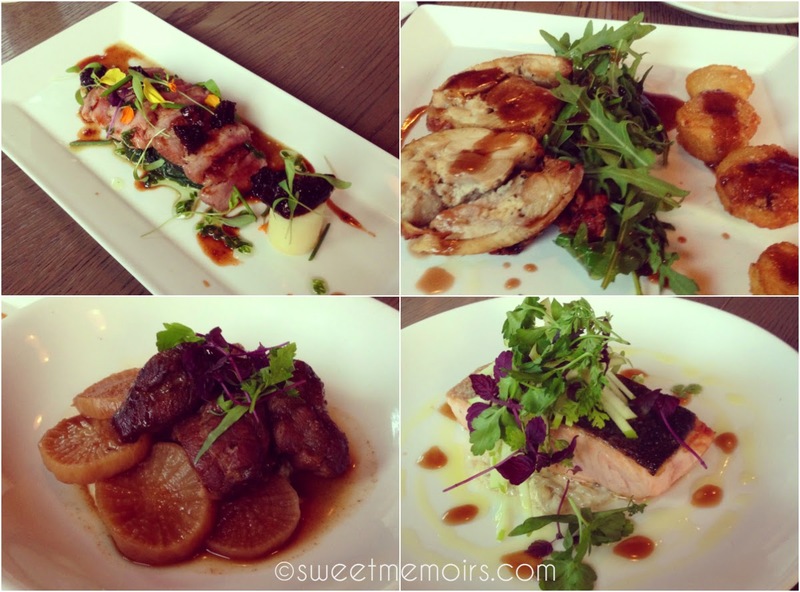 We have dined at Long Beach, The Wine Company and RedDot in particular. This time around, one of my ex-colleagues booked us a table at The Disgruntled Chef Restaurant and Bar which is located just behind Long Beach. 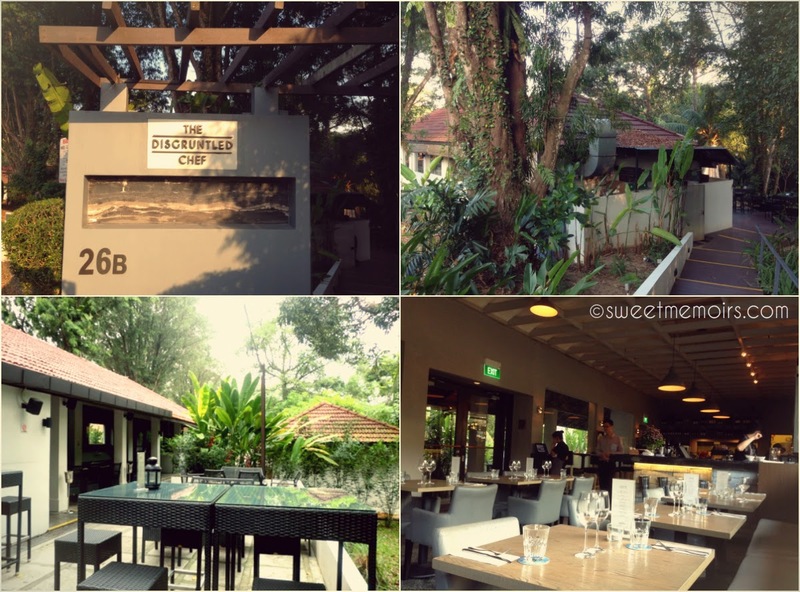 The Disgruntled Chef is nestled within the lush greeneries of Dempsey Hill. The lower left photo isn't mine, it is from lifelittletales blog. I regret that I didn't take a photo of the al fresco dining area, I have to say though that it is far more beautiful in real life. The outdoor dining area is literally a breath of fresh air. If you are a nature lover like me, you'll love it there be it on daylight or at night. We chose to be seated indoors as one of my ex-colleagues is extra sensitive with mosquitoes. Thankfully, the wide and transparent glass windows provided my much needed green therapy. In fact, the picturesque windows are what made The Disgruntled Chef stand out (IMO) and gave it numerous plus points on its ambiance. The whole indoor rectangular dining area is considered small but the windows with green views made it look very spacious. When we browsed the menu, one of my ex-colleagues noted that there aren't much choices for dinner. You can either order from the "small plates" and "big plates" menu selection. For appetiser, sides and starter, we had crispy fish skin and chips, baked asparagus, roasted mushrooms with garlic butter and pork knuckle in a bed of mashed potato. We all liked the crispy fish skin. The only male in our group joked that since we all loved it, we can order more of it, skipped dinner and just drink the night away. 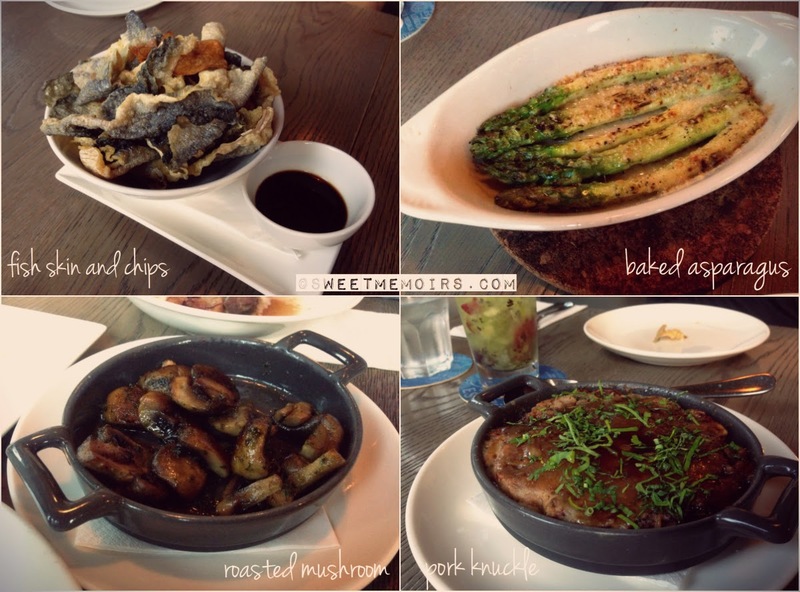 The roasted mushroom and baked asparagus tasted just fine. The pork knuckle is actually from the "small plates" special offer of the night. I was expecting a pork knuckle complete with big bones and all but was surprised that it came as pork knuckle meat served as topping on the mashed potato. It was good but there are more mashed potato than pork knuckle meat. For our main entrée, we ordered from the "big plates" menu selection. Clockwise from upper left: duck (special dish of the night, can't remember the exact description), roasted stuffed chicken, braised pork cheeks, and roasted salmon. The description "big plates" got us fooled. The dishes are indeed served in big plates but considerably small servings. The duck dish was a big disappointment, although it looks like it's the "best dressed" and drool-worthy of them all it was actually a little bit undercooked you had to chew a little longer before you can turn it into something digestible. The pork cheeks as well, although tender, was a bit dry. We were expecting something that falls apart by itself with just a touch of a fork but it isn't the case at all. The radish that came with it is good nonetheless. On the other hand, the roasted stuffed chicken served with foie gras mousse, hash browns and sauce perigueux along with the roasted salmon with creamed fennel and apple balsamic reduction are worth raving about. They are both so good, both definitely deserve to belong to the must try category. The roasted chicken and salmon were both fresh, juicy and savoury, I am literally salivating while typing my description. 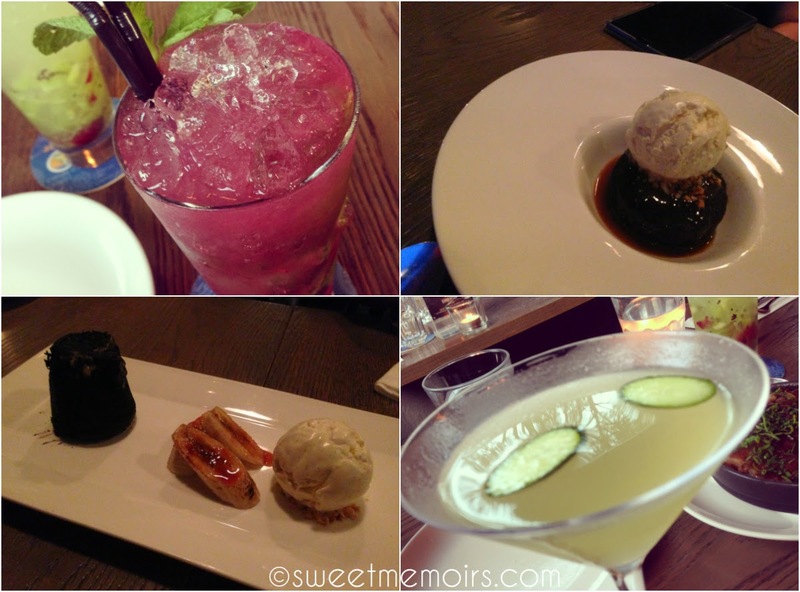 For drinks and dessert, we had (clockwise from top left) wildberry mojito + elderflower and kiwi cocktail (as seen in the background), sticky toffee pudding, chocolate fondant and grapefruit and cucumber martini + asahi dry beer (not in photo). The desserts are good but too small serving and the cocktails are just okay. Total damage for 4pax: $321. Much, much more expensive than in PS Cafe, my eyes literally popped when I saw the ribeye steak priced at $98. We will definitely not come back here again. There are many other dining options available that offer good food and great ambience at an affordable price. The place is definitely for people who have so much excess money to spend doesn't mind spending more. Please do note that the service is excellent.